When I was young, I realized a paradox. I remember thinking, "there are hundreds of religions, and they all think they are right." Even as a young child, I had this kind of self-awareness that my own faith was not exempt from this kind of rigid mindset. If we didn't believe our faith was true, we wouldn't practice it, but with so many different faiths, how can any one of us claim to have the monopoly on truth? Writing a picture book looks easy. How long can it take to write less than 500 words? Actually, it can take a really long time! For my book, it took almost two years of editing, revising, and research. Yes, the time spent to physically write down the words isn't that long, but there are hours of work behind every single word. I spent a long time researching and reading other picture books, interfaith texts, and scriptures from many different faiths. Because of this, I found some really wonderful resources that not only helped and inspired me, but that I think anyone interested in interfaith should know. This book uses artwork and quotes from children to present a child's eye view of the creator from all over the world. The book is filled with quotes and artwork done by children from many different faiths and nationalities. The pictures and descriptions are funny, sweet, and often poignant. Whenever I do a book presentation, I do this activity with the kids where I ask them to draw a picture of what they think God looks like. It's always an enlightening and fun exercise. This book is like being able to do that workshop on a world wide level. It reminds us that children are very much in-tune with spirituality, often more than we realize. A refreshing take on what it means to embrace Interfaith as its own faith. This book not only provides countless philosophical insights, but its primary goal is to give practical resources and suggestions on how to create an interfaith community. Through personal experience, trial and error, and research, this book is a great building block for anyone interested in facilitating or developing interfaith programs. This was actually one of the first places I went. It's a huge volume, but the layout allows you to search based on topic and shows quotes from different scriptures next to each other in the context of the topic. Part of my idea for the book was to make a sort of "world scriptures" for kids. In many cases, I started here to find sources, and then searched for the original or an updated source to find the best translation. If you really want to go down the rabbit hole, check out this extensive archive of old and sacred texts online. This is an incredible resource of texts dating back to the 1800's. Extremely interesting for any scholar, and guaranteed to consume you for at least a few hours. Click at your own risk! You may have noticed that the first two books were published by the same company. I found this publishing house during my research. They publish religious and spiritual texts including interfaith and books for children. A list of their children's books for different age groups can be found on their website. What are some of the best resources you've found that promote interfaith, especially for kids? I'm always on the look out for more! Let me know what you think and share your favorites! The World God Me for Me was recently featured on Shopcompliment.com, a website that sells beautiful products, but with the intent of helping think about our choices and make better decisions as consumers. 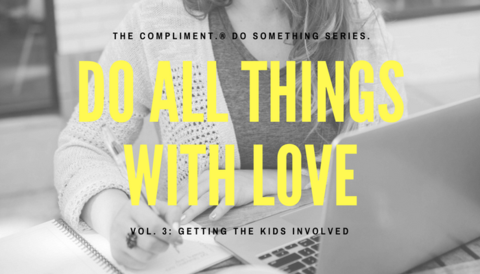 On the blog it states, "The most powerful thing we can do as a society is teach our children how to be compassionate, kind, and tolerant advocates for themselves, each other, and our planet." Check out the post, read more, and shop here! I gave a presentation recently to a group of parents on teaching interfaith to children. We had a great discussion about why it’s important, and how to begin. Before we start talking about interfaith, I often get asked about how to talk to kids about faith in general. There is a real desire for many parents to instill the traditions or importance of spirituality in their children, but they just don’t know how to start the conversation in an age appropriate way. That’s one reason I wrote “The World God Made for Me”. It came out of my desire to talk to my own children about faith, and made me ask the question, “What do I want them to know?” Here was my answer: I want them to know that they can have a personal relationship with God/the divine/the universe (whatever you want to call it) and I want them to know that we are all in this together, that people might believe in different Gods or no God, but that there are important and wonderful things we can all still agree on. So how do we begin the conversation? You are walking this walk together and the conversation about faith is something that will continue throughout you and your child’s life. You don’t have to start quizzing your child on scripture or including them in traditions that they don’t understand. Start small, and as they get older you will be able to introduce more complex ideas. Ask yourself, what is the most important thing I want them to know right now? Boil things down to a single concept: Love, gratitude, respect for nature, and find little ways to bring those concepts into daily life. Most children love nature, because of this, Creation stories are a great way to begin the conversation about God. Read the creation story from your own tradition and read Creation stories from other faiths and cultures. There is a reason that so many scriptures consist of parables. We learn through stories, especially young children. Seek out age appropriate books or media that have a message of faith. Remember though, to talk with your child about what she is reading or watching. You can help guide the discussion and connect the dots on how it applies to their own life. This is a common misconception that I have found through my own life to be completely false. I think we need to be willing to let our children think critically about their faith. When we study other faiths with an open mind, it has been my experience that we find much more in common than we do differences. We live in a multi-cultural and connected world. Chances are high that your child will interact with people of different faith backgrounds. Putting theological issues aside, having children see that children in other faiths are like them in many ways is a good lesson in empathy. On a larger level, if we want to create a world where religious violence is a thing of the past, then we need to teach the next generation that it is possible to find common ground. Remember that this journey of faith is one that will last a life time. As parents, we are still walking our own path. We never stop pondering the big questions. It’s okay to say, “I don’t know” or “Here’s what I believe, but other people think this...” Show them that it’s okay to ask questions, and that you will always be there to help find the answers. When I began the process of writing my book, I knew it would be tackling religious diversity. This is something that is often overlooked when we hear the word “diversity.” The term “interfaith” is still a word that sometimes brings questioning looks. I had several people ask, “what is that?” when I explained that I was writing an interfaith children’s book. Others, met the idea with excitement. I knew that there were people looking for books that tackle religion and faith in a diverse way. There are publishers out there that specialize in Christian books, or Jewish book, or Buddhist books, but interfaith books are few and far between, especially for children. Why is this? Interfaith is not necessarily new, but to a large extent it hasn’t caught on in the mainstream. Still, there is growing population of people who identify with more than one faith, or none at all, but who identify as spiritual in some way. We are a diverse society, not just racially or culturally, but also religiously. Religion plays a huge part in many people’s lives. It informs our worldview, and is intertwined with culture and identity. Our world is only getting smaller, we have to learn how to live and work together. When cultures clash, will it inspire learning and growth, or fear and violence? The answer is up to us. As we have seen time and time again, religion often plays a role in some of the world’s biggest conflicts. Some argue that this is evidence of religion as outdated and dangerous, and that the ideal is a completely secular society. I do agree that we need to curb extremism, but I think the best way to do that is for religious people to be part of the solution. It is unrealistic to expect people of faith to give up something that is tied so closely to their identity and culture. We can however, appeal to our common humanity, and the parts of religion that call for each of us to take responsibility for living a life that benefits the world. Interfaith education is about really studying and understanding other faiths. There are many differences, and it’s not about making them all the same. Generally though, the things we have in common are the “Big” ones, the most basic expressions of humanity: Love, service to others, a belief in a higher power. They may be expressed in different ways, but they are things that people of all faiths have in common. Besides belief in a higher power, these are also things that people with NO faith have in common. When we start to see the ways that we are the same, we can more easily celebrate our differences. We can find ways to come together on the things that affect all of us, like poverty and human rights. What do I want to teach my children? My own journey of faith has obviously played a big role in creating this book. I was lucky to grow up in a family that taught me to have respect for and learn about other faiths. The most important thing for me, is to cultivate a personal relationship with the divine, but not be tied to a strict view of what that looks like. This was the biggest question for me, “What do I want to teach my children?” It became the catalyst for the creation of Paper Dove Press, and the book series. I want them to know and understand other faiths. I want them to see others as brothers and sisters of the same human race. I want them to love themselves and love others. I want them to not be guided by fear, but by love. I want them to not just tolerate those who are different, but to learn to put themselves in other people’s shoes and to understand that for the most part, we all want the same things: love, relationship, comfort. I want to teach them that peace begins in our own hearts. I worked closely with illustrator Abi Reid to make sure that the characters in the book showed religious and cultural diversity. Abi also made the suggestion to highlight different socioeconomic realities. I loved this idea, and am so happy that it became a part of the book. The book is not meant to be a comprehensive look at faith or to be the go-to for answers. I don't want it to be preachy. To me, it’s more of a starting point. It’s the beginning of a conversation that will grow and evolve over time. Just having all those quotes together on the same page is a big deal. It’s opening the door to further discovery, and hopefully opening some hearts as well. That’s what faith is to me, it’s prying open your heart inch by inch every day. Laurel Nakai, author of The World God Made for Me, available through Paper Dove Press and Amazon. What a year! Thank you so much for helping make this year so fantastic. This year, one of my dreams came true. Publishing this book was such an exciting and wonderful experience, and the best part is that we did it together! Thank you all for your support. This is only the beginning. I can't wait to share with you all the wonderful things ahead in 2016. Wishing you all the best in the year ahead! With Thanksgiving on the way in the United States, it's a wonderful chance to talk about gratitude with children. Generosity and gratitude are important values to model and teach. There are lots of ways to create small habits of gratitude at any time of year. praying before a meal, bedtime or first thing in the morning, is a chance to pause and appreciate the things and people in our life. Whether it's a religious prayer to a higher being, or a simple moment of silence, creating a space where we stop to consciously think about the things we are grateful for is a habit that can benefit a child of any age. Being grateful for what we have directly affects our ability to empathize and be generous with others. Service is also a wonderful chance to experience how other people live. Helping others will almost always make us feel grateful for what we have ourselves. It's a beautiful circle of giving! It's a simple thing, but something we often forget: tell the people in your life how much you care about them. When children are young, positive reinforcement is extremely important for self-esteem, belonging, and shaping behavior and how they see the world. The best way to encourage our children to be people who give words of encouragement and love is to model that behavior ourselves. For an interfaith look at some of the ways different faiths and traditions talk about gratitude, check out this Gratitude sheet I made featuring quotes and prayers from different faiths! Click on the picture to get a printable pdf version. One leaf is left empty for you to write in your own quote, prayer, or gratitude list! Try the coloring sheet version! Be the first to receive your copy when the books come in! Right now I'm only fulfilling orders for those that donated during the kickstarter, but you can pre order copies now and be the first to receive it when they come in stock!